This post is featured today on the Fat Quarterly blog - how exciting is that ! Recently the Fat Quarter Team entrusted me with some Aurifil Thread in a Designer Challenge. The brief was to create something using either one or all of the provided gorgeous Aurifil threads. 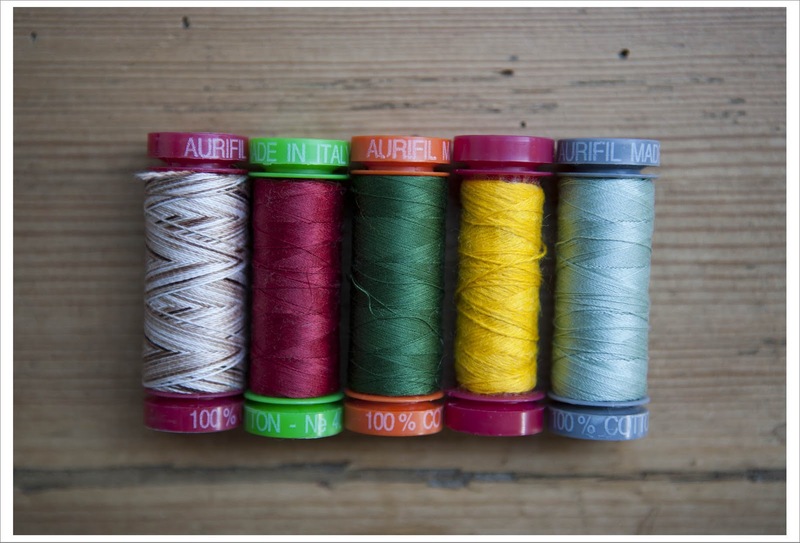 I have become aware of Aurifil thread sometime last year or even the year before and I believe it was first at the Birmingham quilt festival. It has become increasingly popular and many quilters are praising its qualities in the highest tones. I have already worked with Aurifil threads before but mainly for piecing purposes for which I very much love it as it produces less lint than my usual Guetermann 50 thread. The threads I was given were a selection of 50, 40, 28 and 12 weight. The 12 weight thread was wool in a rich matt yellow that immediately caught my eye. I pondered for a few weeks about which projects would be good to showcase the threads best apart from using decorative stitches (which I did as well with the light green but I get to that in a later post) and finally decided on making myself some new cushions for my living room sofa. 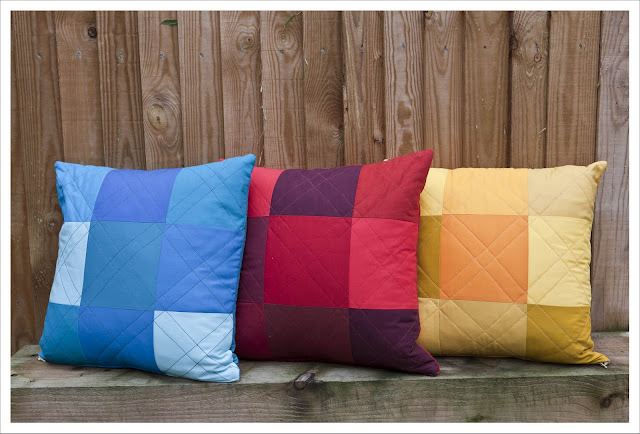 The three pillows I produced are all made in the same pattern; the front a lock cabin pattern and the back a simple 9 patch. 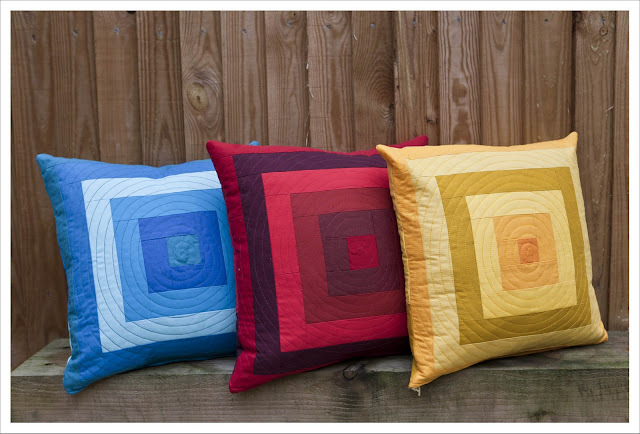 The quilting is also the same in all three. The fronts are done in a concentric circle and the backs in a diagonal crosshatch pattern. This little number here is called "Red Hot" and is made of 6 different shades of red. 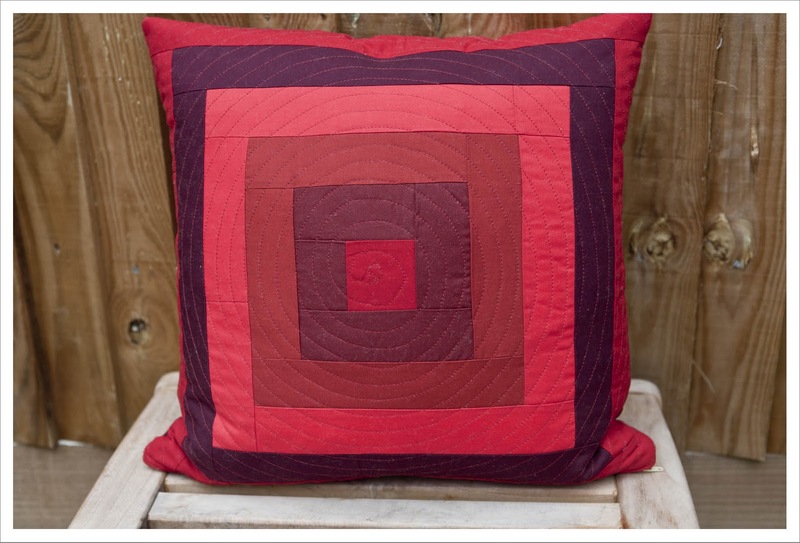 I quilted and pieced this pillow with the 40 weight thread in red and loved working with it though I do prefer a thicker thread for quilting normally. All reds are Kona Cotton and are from existing stock. "Caribbean Dreams" was pieced with the 50 weight Aurifil thread in green but I used a thicker No 16 Perle thread for quilting as the quilting with the 50 weight fibre would have been to subtle on the pillow and would have missed the effect I wanted to achieve. The colours of this pillow are so rich and really transport me to my next holiday destination in my dreams and brings visions of warm days, the beach and turquoise blue waters..... all a far cry from typical UK winter weather. The fabric used for "Caribbean Dreams" consists of a selection of Kona solids and Freespirit Designer Solids from my existing stock. 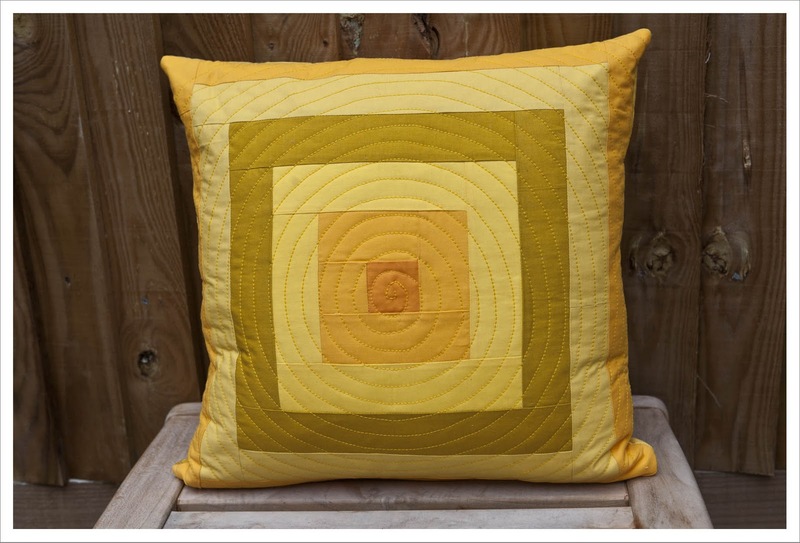 I titled pillow number three "Summer Melody" with its six different shades of summer yellows. It is such a warm and inviting pillow. I pieced this pillow with a normal Aurifil 50 weight thread (not from above selection) but quilted it with the wool weight 12 in yellow on my machine ! At first I thought the thread would not be able to withstand the strain of machine stitching but it was no problem with two little adjustments to the settings; one was to use a top stitch needle because of the thickness of the thread and two was to reduce stitching speed somwhat. The thread worked fantastically and really gives the pillow a beautiful texture. 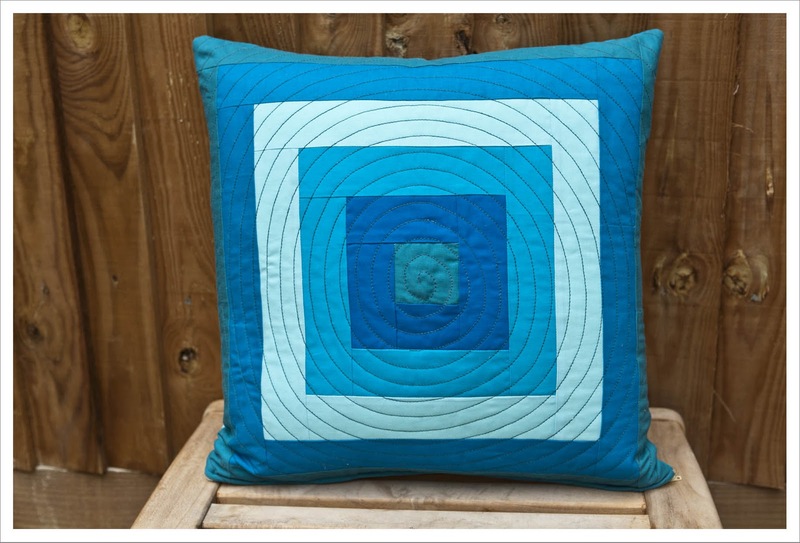 All fabric used for this pillow are again Kona solids and Freespirit Designer solids from existing stock. 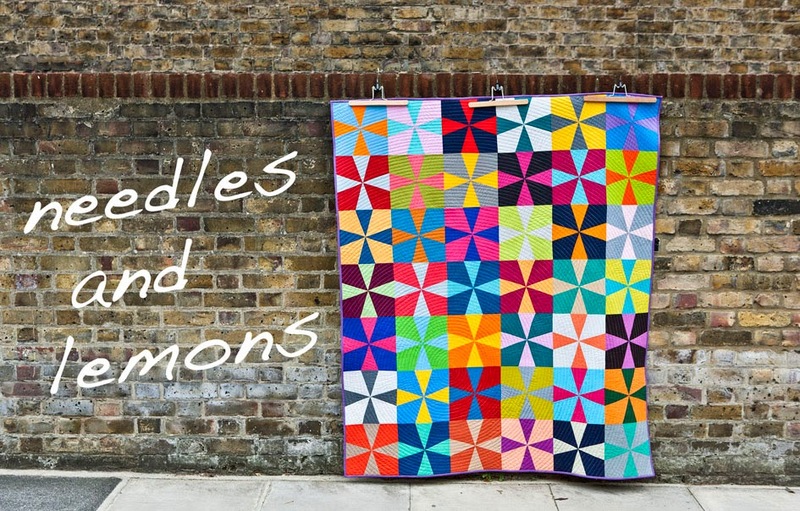 The verdict is that I loved working with the threads and I was impressed with all of them but perhaps mostly with the woollen one though admittedly one would not use it for larger quilting projects. I will try in the future some of the 28 weight colours for quilting purposes in addition to the 50 weight Aurifil I already use for piecing. 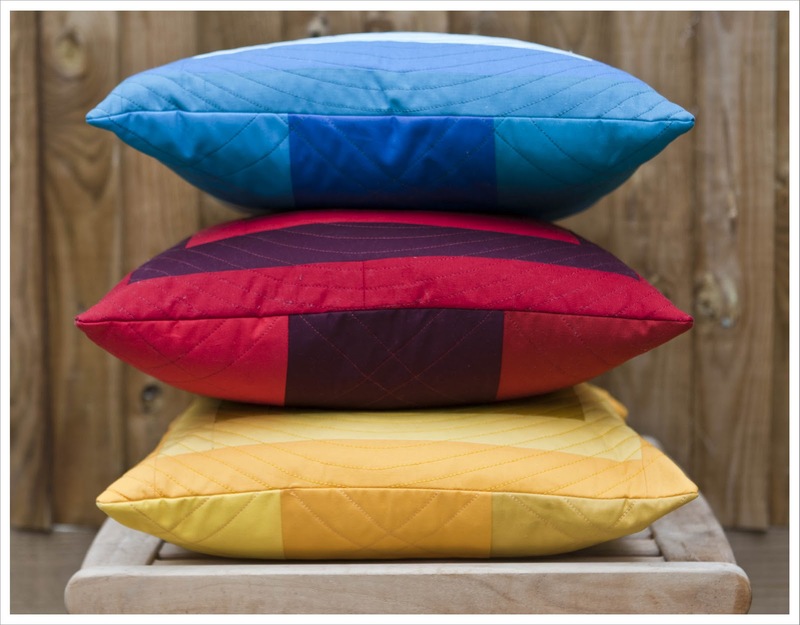 Those pillows are so nice, a set of primary colours!